It is without a doubt that we Malaysians love our food! Food is a powerful connection that never fails to bring people together. 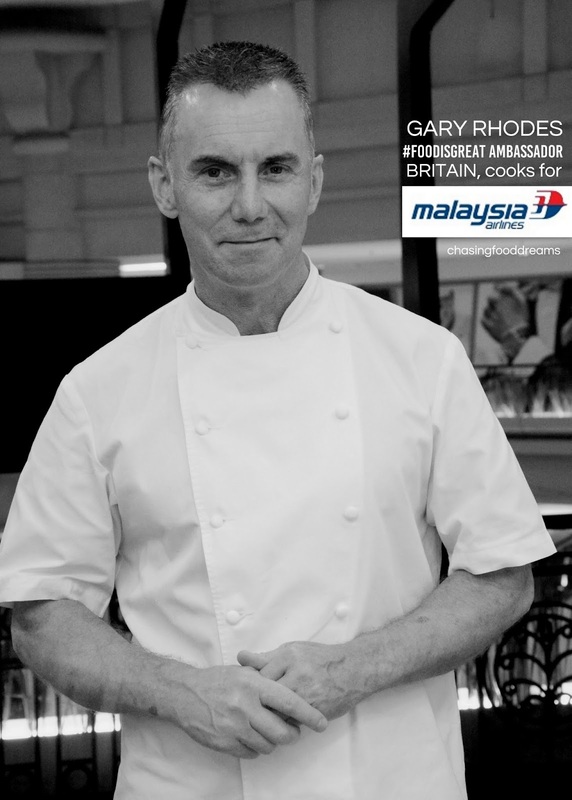 Our national carrier, Malaysia Airlines has flown in the Michelin star Chef Gary Rhodes with a collaborative effort with UK Visit Britain to give Malaysians a taste of British cuisine. Starting 2 November 2015, Malaysia Airline's First Class passengers and Enrich Platinum members are treated to a British feast by Gary Rhodes, exclusively available only at the Platinum Lounge in KL International Airport for two weeks. A rare invite was extended to me to experience a personal cooking masterclass with Gary and the Malaysia Airlines chefs at Culinary Studio in Starhill Gallery one morning. Thrilled to max, an opportunity to learn from a Michelin star chef is indeed precious. Thanks to Malaysia Airlines, it is an honor to be able to experience this masterclass. Malaysia Airlines Berhad has been making extra efforts in relaunching their new since September this year. With aims to enhance their services under their latest campaign #todayishere, the nation’s carrier strives only for the best. Connecting Malaysian with food, Malaysia Airlines is set to leave a delicious mark on their flyers with Gary’s creative dishes. A chef so detailed, he insisted on even making sure each ingredient is prepared to the best it can be. From trimming the beef to preparing each condiment and downright to the sauce, watching Gary work is an amazing experience. The class was in awe of his skills and knowledge. From chefs to media to me, it was almost pretty much silent throughout his class as everyone gave their full attention to Gary who proceeds to meticulously showed us his creations. In line with the British High Commission's Food is GREAT campaign and Malaysia Airlines, Gary has created a 3-course meal of Pan Fried Sea Bass, Grilled Sirloin Steak and Fried Bread & Butter Pudding. Elevating Malaysia Airlines’ First Class passengers’ dining experience on-ground is the perfect start to kick off a scrumptious journey to come when they board the A380 to London and other locations in UK. His first course of Pan Fried Sea Bass with Spring Onions and Creamy Potatoes looked flawless. Sea bass fillet are lightly seasoned and floured before pan seared in butter till golden. Served on classic British side of creamy mashed potatoes and crowned with a medley of spring onions sauce, the sea bass was truly sumptuous. The delicate fish had gorgeous robust flavours of aromatic spring onions, light hint of chili note, sweetness from mirin and umami notes from soy sauce. A pinch of 5-spice powder added a hint of unique note to this dish. The dish looked relatively simple but a lot of effort goes into perfecting the cooking of the fish and the balance of the sauce. The main course of Chargrilled British Sirloin Steak with Buttered Spinach, Roasted Cherry Tomatoes, Black Olives and Basil Cream Hollandaise was presented in elegance and vibrant colors. Gary took quite a few minutes to trim the cut of beef, explaining that a certain ratio of lean beef and fat is essential to a GREAT steak! All the condiments of vegetables, basil puree and Hollandaise sauce can be prepared in advance as these do take up some time from all the cooking process. Making Hollandaise can be quite intimidating but Gary whipped it up effortlessly. The finale was to make sure to render the fat on the steak and grilling it to the diner’s liking. Gary reminded all of us to be patience when it comes to cooking steak. After rendering the fatty end of the cut to crisp, he cooked the steak on each side for only a few minutes on high heat. He proceeded to finish the steaks in the oven for another few minutes. To achieve a succulent steak, one must let the meat rest for a few minutes to let the juices flow evenly through the meat. When it comes to assembling the dish, nothing is rush for Gary. Every ingredient is carefully plated with organized elegance. Even when Gary drizzled the sauce over the steak, it was carried out with such fastidious actions. The finished platter oozed with temptations of a GREAT steak. A taste of the steak had me at hello! Utterly juicy and tender, the steak was also super in flavours. The buttered spinach, oven dried cherry tomatoes confit, black olives and basil cream Hollandaise enhanced all my flavour senses. It was savory, buttery, tangy, sweet and more in my mouth. Steak lovers should not miss this! Bread and Butter Pudding is just about as British as it gets in desserts. Gary’s version is Fried Bread and Butter Pudding with White Chocolate and Date Fingers with Vanilla Ice Cream and Date Syrup. It looks rather plain but once you have tasted the dish, you may not be able to resist the dish. It is the richness of the ingredients that truly boosted the flavours of the dessert. The bread and pudding has a white chocolate base in the recipe, making it extra rich. To finish the dish, he takes the bread and butter pudding and pan-fry both sides of the dessert to achieve a lovely crispy touch. Don’t miss this scrumptious 3-course by Gary Rhodes! Travel First Class on Malaysia Airlines on A380 to UK and visit the Platinum Lounge in KLIA to savor an unforgettable experience of Gary’s British fare. 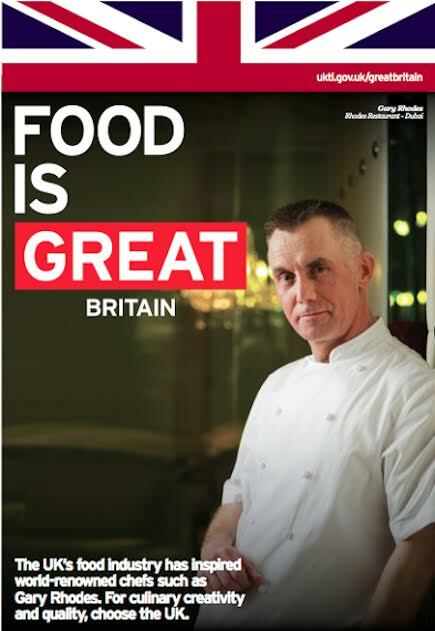 For the whole month of November, Visit Britain #FoodisGREAT campaign also has plenty to offer for many traveling to London. Experience countless gastronomical dining in London as well as its famed attractions by traveling direct to London with Malaysia Airlines. Malaysia Airlines A380 flies from Kuala Lumpur to London twice daily. Visit Malaysia Airlines website: www.malaysiaairlines.com and Facebook: www.facebook.com/malaysiaairlines for more information. Lucky you! That sure was exclusive! I'd be happy to have these food anywhere, let alone in a flight, lux!